The Russian government hopes that as a result oil prices may increase or at least stabilize. Pictured: A worker of RN Purneftegaz, a daughter company of Rosneft, is seen here at the Barsukov oil field, Yamal Nenets Autonomous Area. The country's top oil bosses have agreed to keep production at January levels in a deal with the government, which is hoping the move will see oil prices increase. However, analysts say that the move may not necessarily lead to a recovery. The heads of Russia’s largest oil companies have agreed to freeze production at January 2016 levels at a meeting with Russian President Vladimir Putin, in exchange for fiscal benefits from the government. 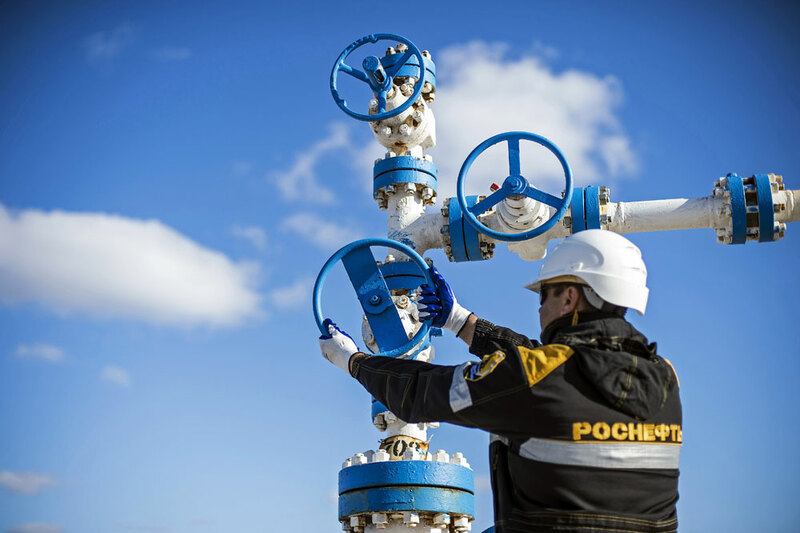 Russian Energy Minister Alexander Novak announced the oil companies' decision following the closed meeting on March 1, describing the position of the meeting's participants as “positive." However, freezing production at the January 2016 level does not necessary imply production cuts. The Russian government hopes that as a result oil prices may increase or at least stabilize. Yet analysts say that the cost of hydrocarbons depends on many factors. "A freeze at the current level of production in Russia is possible and moreover, it will be very advantageous if OPEC members and other oil producing countries agree to a reduction of oil production," said Ivan Kapitonov, a professor at the Russian Presidential Academy of National Economy and Public Administration, an economy institute close to the government. In his view, the advantage for Russian oil companies lies in the fact that with the current level of taxation it is unprofitable to develop new deposits and now they will be able to reduce their investment programs. The meeting between the head of state and the heads of the oil companies took place in the boardroom of the Kremlin's Security Council, where the most important and confidential meetings are held. Such a decision would have meant losing a share of the market and not seeing a return on investments. Russian President Vladimir Putin remarked that in 2015 Russian oil companies had produced a record of 534 million tons of oil, which is 1.4 percent more compared to 2014. In exchange for agreeing to freeze oil production the companies will be able to receive fiscal benefits or at least obtain a reduction of the current level of pressure, despite falling budget revenues, Energy Minister Novak told RIA Novosti. However, he said, the issue of fiscal regulation for the oil industry will first be discussed by the government. In February 2016 Russia, Saudi Arabia, Qatar and Venezuela agreed to maintain production at the January 2016 level on condition that other producing countries join the initiative. Ecuador, Algeria, Nigeria, Oman, Kuwait and the UAE have announced their readiness to freeze production but no formal agreements on this issue have been signed yet. Meanwhile, Iran, which has been freed from Western sanctions, is threatening to increase production. "The oil production level freeze that Russia and Saudi Arabia have agreed to is most likely a ‘verbal intervention’ rather than a real factor that would influence the price," said analyst Alexei Kalachev from Finam Holdings. He added that the countries had agreed to freeze production at the January level, which was one of the highest in history. However, Dmitry Bedenkov, chief analyst at Russ Invest, pointed out that today oil prices depend not only on producers but also on demand from key consumers, first and foremost China. According to him, oil demand from developing countries is constantly falling. Georgy Vaschenko, director of operations on the Russian capital market at Freedom Finance, believes that the low demand is likely to keep prices in check until at least 2017.